AIM-9 SIDEWINDER: The highly agile Sidewinder is used against maneuvering targets. It homes on heat - for example, from the enemy's jetpipes. Range 5 miles. AIM-7 SPARROW: The Sparrow homes on radar energy reflected from the target, which must be illuminated by the F-14's radar for the whole of its flight. Range 28 miles. AIM-54 PHOENIX: Weighing in at almost 1,000 lb., costing $2 million and with a range in excess of 90 miles, the AIM-54 is the world's biggest, most costly and longest-range air-to-air missile. Tomcat can launch six AIM-54s simultaneously against separate targets. The missile's onboard radar fits the F-14 turn away after launch. Range 90 miles. BOMBCAT: The Tomcat can carry a range of dumb (unguided) bombs for use against ground targets. Tomcat squadrons began training in the bombing role in 1991. The main threat to U.S. Navy carriers is posed by long-range bombers armed with sea- skimming missiles. 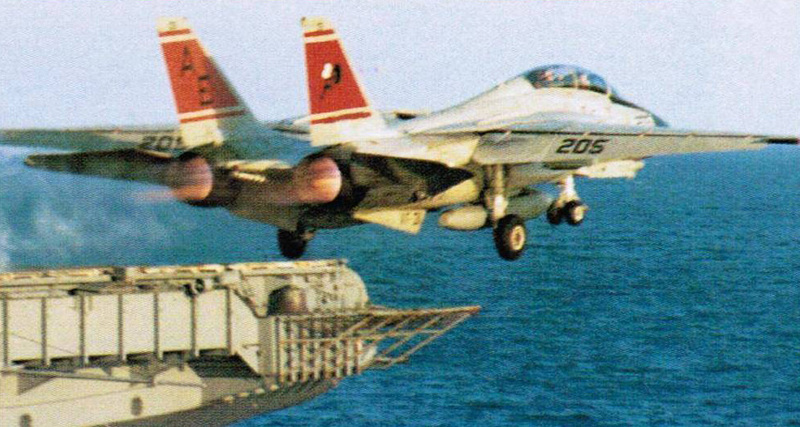 Only Tomcat can intercept the bombers before they get within lethal range. The F-14's high-thrust TF-30 turbofans and swing wing allow it to operate from short carrier decks. Takeoffs are made using a powerful steam catapult. 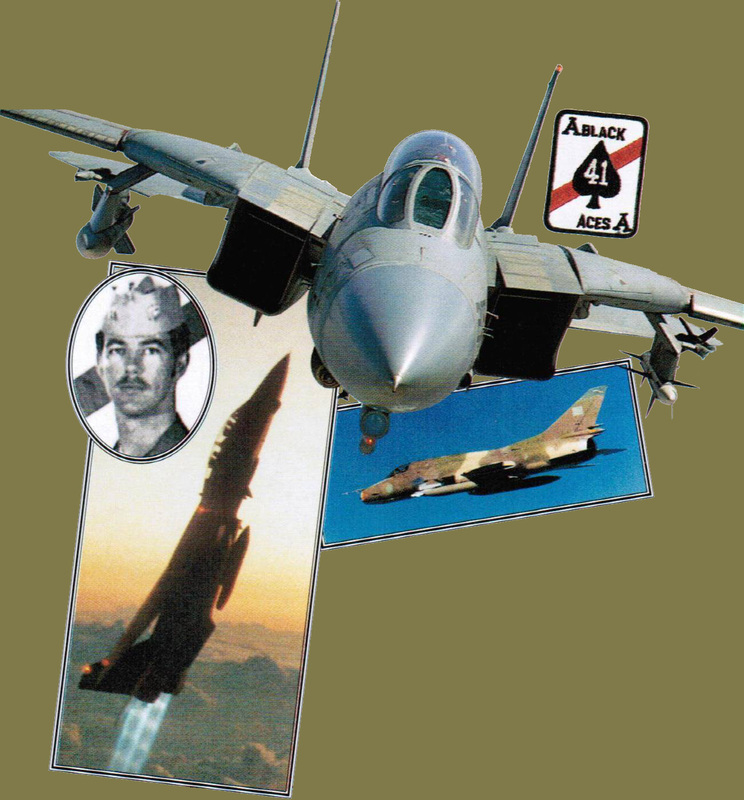 The F-14 opened its score on August 19, 1981, when F-14 pilots Lt. Larry Muszynski (above) and Cdr. Hank Kleeman of VF41 "Black Aces" squadron destroyed a pair of marauding Libyan Sukhoi Su-22 "Fitters." 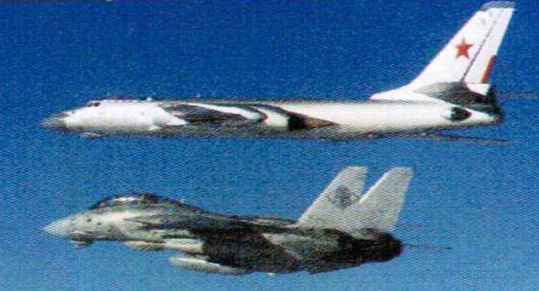 Two MiG-23s fell to F-14s in a similar incident during 1989. The F-14 has Mach 2+ performance, a sparkling rate of climb, good maneuverability - all the hallmarks of a great fighter. As well as its own radar, the F-14 operates with an E-2 Hawkeye, a flying radar station with a huge rotating antenna above the fuselage. 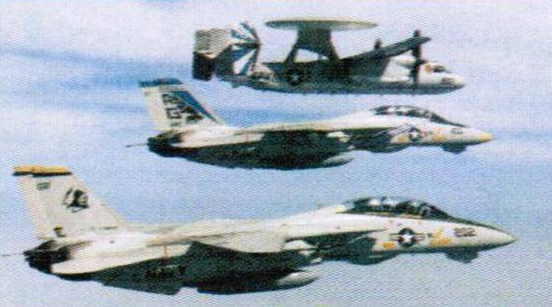 ▶ The Tomcat's AWG-9 radar can detect, track and engage targets at ranges of more than 100 miles. ▶ One Tomcat can engage the same number of targets as three F/A-18 Hornets. ▶ The AIM-54C Phoenix is the world's longest-range air-to-air missile. ▶ The Tomcat's high magnification TV camera enables visual target identification at more than 30 miles. ▶ Forming the outer edge of a battle group's defenses, the Tomcat can engage enemy bombers and missiles more than 500 miles out from its home carrier.